How does the Mediterranean style look? "Openness, brightness and the charm of the South." There are two conspicuous types of this style, the first is the Greek Mediterranean furnishing style with excellent textures, tile work and carved plasterwork. The second is the Italian Mediterranean style with earthy tones, red roof tiles, terracotta, ceramic and leather furniture. In addition, warm colours for wooden furniture and exposed wooden beams against painted walls with antique effects, mark the Italian style. As accent colours, you can see yellow, poppy red, olive green or cobalt blue. Light is an important issue in the Mediterranean furnishing concept. Originally, the rooms were only limitedly lit. Small windows, canopies and coloured, floor to ceiling window shutters served to shade the interior well in order to survive the hot summer months. Modern adaptations of the Mediterranean style are much lighter and are often combined with large window fronts. The pigment Ochre is typical for the Mediterranean furnishing style with a focus on earthy tones, and is mixed with Limonite, clay minerals, quartz and limestone in the Mediterranean region. Its facets range from yellows, via orange and red, to brown and are complemented by soft terracotta-rosé. The Mediterranean style also contains shades of green and blue, as well as the violet of the lavender fields in Provence. How often does one want to be able to capture the emotions and impressions of the southern countries and to feel at home, as if you were just there? Through the use of various mafi collections with different types of wood, you can make your home just like the southerners do. 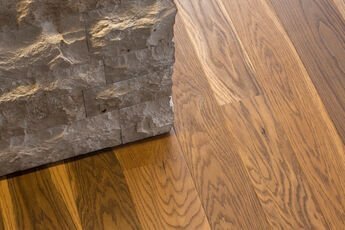 The best types of wood for this purpose are Oak, Beech, Maple and Larch natural oiled, to reflect again the earthy tones. 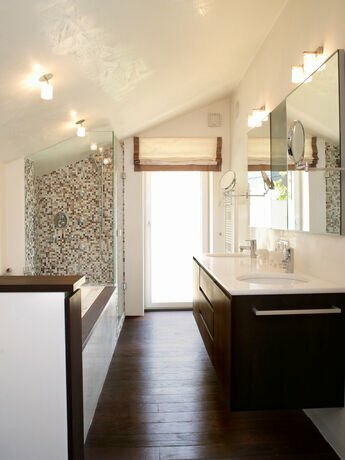 Depending on the lighting and colour concept, the floor can range from a light yellow to a dark brown tone. To this natural furnishing style, wood with knots is gladly combined as long as it should not appear too dominant. 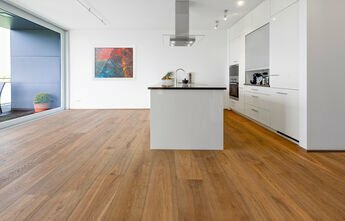 The OAK Character or OAK Sand are primary examples, to name just a few.